Most of the time when you hear what Lawrence Yun, chief economist for the National Association of Realtors has to say — it’s during a congressional hearing or on the national news. But last week, Yun made an appearance before real estate professionals gathered for a meeting of the Greater Tampa Association of Realtors. 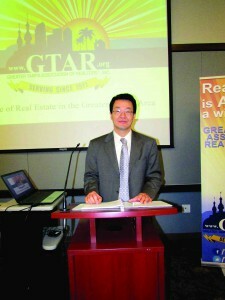 Lawrence Yun is the chief economist for the National Association of Realtors. He’s predicting a continued recovery for two to three years, and then possibly an expansion. He offered plenty of food for thought about the housing market’s condition. “The bottom line is that we have encountered some degree of recovery. 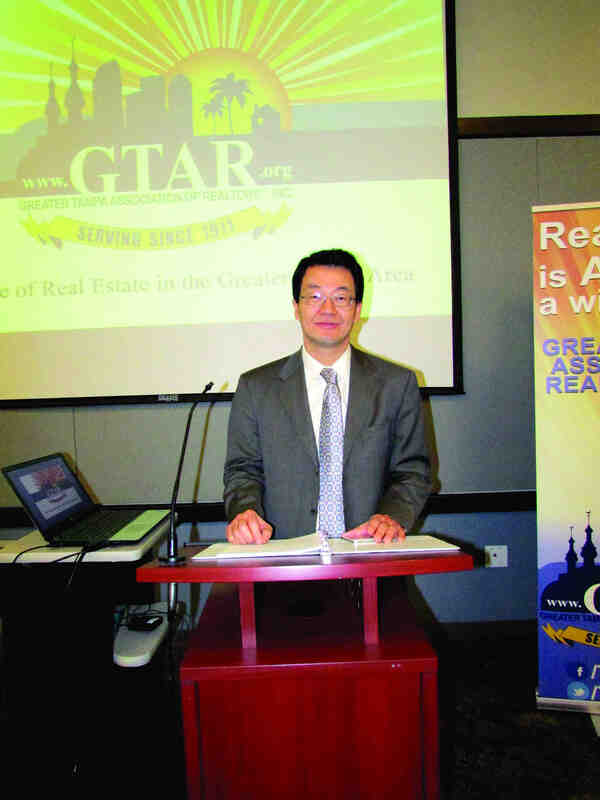 I think we will continue the recovery over the next two to three years, and then subsequently, the recovery may well change into expansion,” said Yun, who frequently speaks at conferences for real estate professionals around the country. “Now, you are just trying to get back to the prior principal in terms of prices. It may take an additional two to three years to get to where it had been in 2005-2006,” Yun said. When it comes to home prices, he said, Florida has a key advantage: Its warm winter weather. Through the years, people have moved to Florida from colder climates in northern states. “It sort of came to a halt during the housing market crash. People up North just could not sell their home, or they were somewhat underwater,” Yun said. The market recovery has put them in a better position to move, which is good news for Florida, he said. “So, you will regain that flow of new residents coming into Florida. Florida has been No 1, consistently, during normal years in attracting new residents,” Yun said. The housing market had generally experienced a two-year recovery in 2012 and 2013, but then stalled in 2014, Yun said. So people are wondering what will happen next. “A two-year-and-out situation would be highly unusual, if one looks at the past,” Yun said. He considers it an anomaly and predicts that there will be a continued recovery that may well lead to growth and higher prices in the market. “One of the key reasons is pent-up demand, Yun said. “We have 37 million additional people living in the country and yet we are essentially getting the same home sales,” he said. “We have lower mortgage rates today,” Yun said, adding that he expects those to increase. But they’ll be at historically low levels. He also expects the pool of buyers to increase because the tight credit market is easing. There are also more buyers coming into the market, he noted. “Many people who went through short sales, many people who went through foreclosures — they went into the penalty box. Now, they’re beginning to come out of the penalty box,” Yun said. An improved job market is another part of the equation. “There’s more people working in the Tampa region, so there’s more potential homebuyers,” Yun said. But housing inventory is tight, which restricts the market, he explained. The builders report that they don’t have trouble selling the houses they build, but not as many homes are being built, Yun said. “When the housing market bust came, many went to Texas and North Dakota — oil drilling,” he said. Another problem is the tight credit market for mom-and-pop builders, Yun said. “New financial regulations have really made it difficult for the local community banks to make those construction loans,” he said. “It was mom and pop who actually built more homes than the national builders, in total,” Yun said. The lack of new housing has an impact on home sales, he said. “We asked consumers, how many homes do you want to see before signing the contract? They will say they want to see 10 to 15 homes,” Yun said. Besides creating forecasts for the National Association of Realtors, he also participates in many economic forecast panels, including The Blue Chip Council and the Harvard University Industrial Economists Council. In 2008, USA Today listed Yun as among the top 10 economic forecasters in the country.